Remember, that whilst you can change the property 'values' you should never add or remove any properties without the risk of the ads not displaying correctly. This tutorial is designed to help you work with Adsense code without the need to log into your account every time you want to make changes or experiment a little. Remember when using the HEX values from this site you do not need the # sign before the number. Just copy the number. 1. When changing values make sure you keep the quote marks around the value e.g. "798645". If you don't, then the ad will not display correctly if at all. 2. 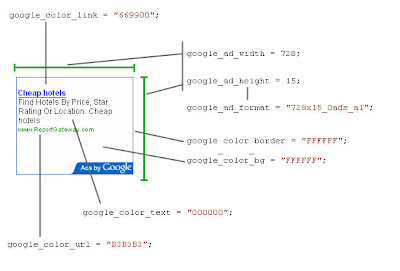 Once again, make sure you check the size of the ad you have changed is an accepted format by Google. 4. Never change the 'google_ad_client' property, otherwise you won't get paid. 5. Play around with colours as much as possible to match the ad to your sites style and theme. 7. 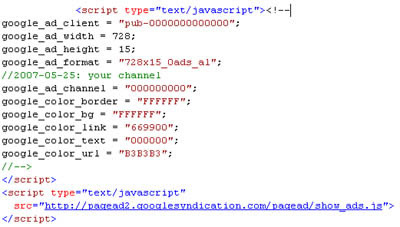 Do not change the 'google_ad_channel' property without first creating the channel in your Adsense account.